Coral Messam is a woman of many talents. Her skills as a dancer have seen Messam work with Kylie Minogue and perform live for illustrious award ceremonies such as the Brits. The Wolverhampton artist is also a qualified choreographer and movement director. Expertise she has put to use both on stage, in plays such as Death and the King’s Horseman and on screen in the smash hit series Game of Thrones. 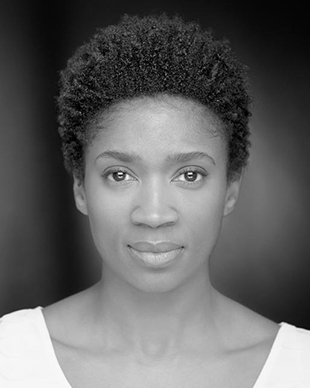 To round off her phenomenal skill set, Messam is also an accomplished actress, having appeared in productions such as Crowning Glory and Feast. It is Messam’s thespian pursuits that are the focus of today’s interview. Currently in rehearsals for her role as Sinead in Everyman, Messam is wonderfully enthusiastic as we discuss this lionised dramatic work. 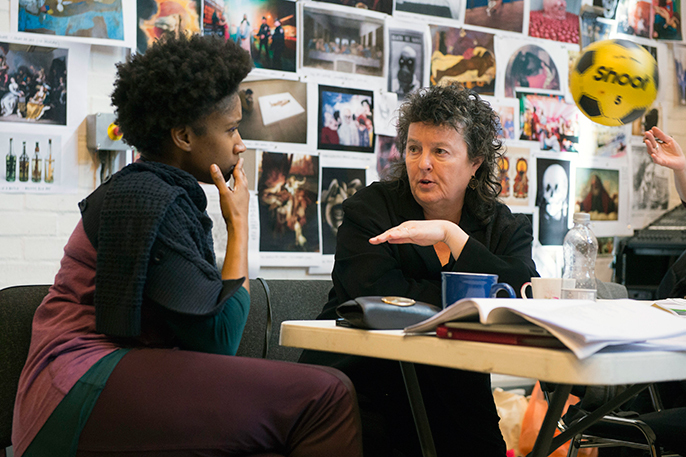 The Rose Bruford graduate explains how this version being written by Poet Laureate Carol Anne Duffy has brought a new authenticity to the play, and how her slight midlands twang fits right into the diverse cast. I find Messam to be a fantastically ambitious and optimistic soul as we discuss poetry, the London party scene and making British theatre history. Everyman is such a renowned play. 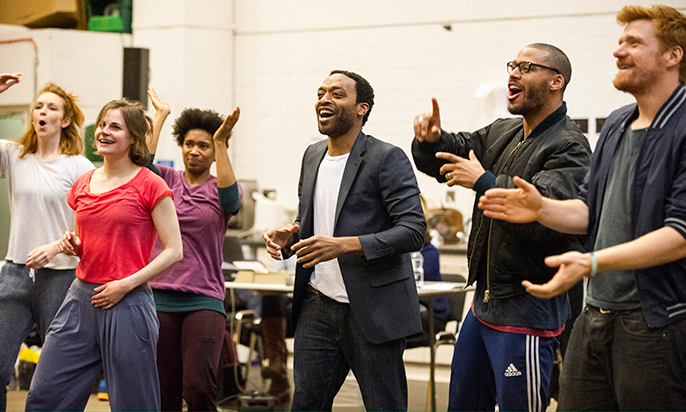 As a character in this production, how would you describe Everyman? I think with Everyman, everyone is going to be able to relate on some level. You’re going to be watching part of history, so come and be part of that history. This is your theatre. It’s a moral play and it’s a very current description of Everyman. In my opinion it looks a little more deeply at how humankind is subject to cause and effect. How we can be disillusioned and blindsided in life, and the things that you begin to appreciate when you realise your time on Earth is almost up. Everyman is the title role, and he’s representing your common man. He enjoys life and giving in to the seven deadly sins; the gluttony, lecherousness and covetousness of life. All those things we associate with being slightly blinkered and thinking of ourselves as indestructible, but when death comes knocking you have to stop and wonder ‘What have I done in my life?’ So it’s a man’s discovery of who he is. It’s tricky to explain in a nutshell because it’s such a vast topic. Everyone can relate to it, and what’s great about this cast is that it’s such a broad spectrum of people, but they’re all a part of this man’s experience. The ensemble play aspects of him and we are manifestations of touch, taste conscious and so on. There’s layers upon layers in this production. How do you interpret your character, Sinead? This is a modern adaptation of the 15th century work. What sort of a social context is this play set in? This production has been written by Poet Laureate, Carol Anne Duffy. How has that affected the play in terms of language? Carol Ann Duffy is such a genius and it’s my first time to see the depth of her talent. What’s so fascinating about the language is that it’s poetry. What she’s so skilful at is capturing the authenticity of how people speak. I’ve got a slight Wolverhampton accent, another of the cast is from Birmingham, we have a hard-core Yorkshire accent and someone from Norfolk so it’s very diverse. There’s a sense of slang and local dialect, so she’s captured how people speak naturally and presents the real core of these people. So the language of the play is organic and it speaks with diversity and truth which makes it incredibly identifiable. Also there’s comedy, there is wonderful lyricism in her writing. She’s also slightly dissecting religion from a modern standpoint; the idea that ‘If you do this, you’re going to hell. If you do this, you’re going to heaven.’ There’s points of Catholicism that she draws on and rather than just making fun of it, she questions it and whether that’s a sort of concept that we want to follow. Parallels are drawn between what we worshipped in the play’s original context and the concepts of wealth and prestige that we focus upon now. The play is so complex and so broad and her perspective and writing has really embellished that. As well as being an actress, you’re also a dance coach and movement director. How did you originally get into that? Well, the movement direction happened almost accidentally. It was the first time that I worked with Rufus (Norris- director) and Javier (De-Frutos-choreographer), which was here in 2009 in Death and the King’s Horseman. I was asked if I could do some movement direction and it took off from there. It’s a completely different discipline to dance. Originally I trained as a dancer and had taught dance and when I was teaching I’d been asked to movement direction for a couple of shows. Back then I was like ‘Do you mean choreography?’ and they said ‘No, movement.’ When I went on to train in drama at the Central School of Speech and Drama, part of my course was a movement module and I instantly thought ‘Oh, right! That’s what people meant; this is movement, for actors!’ It’s not making shapes or sequences; it’s about getting into your body, whether as an actor or a dancer. I realised that I did already have that skill although I didn’t realise it. So when I was asked to do movement direction in Death and the King’s Horseman it was something I enjoyed. Before that production I had worked with DV8 Physical Theatre for two years, so I understood what that world meant. It’s about finding movement without being corny or external about it, getting into character through the physical body. So for me that was part of my transition as a performer and I learnt a lot from that experience. It’s imperative, because unless you’re in your body, you have no presence and that’s what movement direction is all about. Also its health and safety too; if you’re in a coiled or unusual position then you need to know how to support your body and be safe. If you trip, you need to know how to avoid hurting yourself. Your daily body is completely different from the body you bring into the rehearsal space and it’s needed in order to transform into your character. You’re also a choreographer. How did you find the experience of choreographing on Game of Thrones? Yes, I did that a while ago, before it became HUGE. We did the pilot which Javier choreographed, and they asked a few of us back saying they wanted things to be more stunt based. While I was doing a play at the Manchester Royal Exchange the director called me and asked me to be a movement coach and choreograph a scene in episode six, which was amazing. I thought I’d just float in there and be told what to do. But I arrived and was told that they wanted a sort of dervish type movement in this scene and to get on with it. So I was sort of thrown in at the deep end. It’s a completely different animal working in TV compared to theatre because you have less time and it’s very choppy and edited, which is useful because it means you can cheat if it goes wrong. (Laughs.) So I was very blessed to be part of that; even now if I email one of the producers to say ‘Well done’ they’ll email me back. There’s a good team and I’m so pleased it has launched the way it has. I had such a great time working in that. I feel quite proud to have been part of that process. You’ve worked extensively within both the dance and the acting field. Which was your first passion? Well dance is a passion of mine, but I didn’t want to be a dancer. I grew up in the 80s and thought ‘How can you earn money doing that? It’s a social thing.’ I wanted to be a fashion designer. It was just that teachers saw me at college and said ‘You have to take it seriously, you’re good at it.’ So it went that way, but I did have a love for drama very early on, and it was so nice to come back and train in the acting world and plant both feet in the two spheres. So it’s been very multifaceted my journey as an actor, dancer and movement director. I think that’s what makes me, me. It works best for me because I get bored easily (Laughs.) Which is shocking, but I have to be interested and it’s important for me to be inspired because it’s tough work. So I have to be moved by it in some way. Did you ever pursue fashion designing at all? No, I got to A Level and dropped it. My mum was a seamstress and as a teenager she used to make clothes for me, so she was part of that influence. I liked the illustration part of it, not necessarily the sewing. But I was a stylist for two years; I had a break between acting and dancing and enjoyed it. But although I appreciate fashion, I decided performing was what I loved. I also did burlesque dancing for a while and enjoyed designing the costumes for that. So it’s been interesting how things have shaped me. No experience has ever been wasted, eventually the dots line up, even if it’s in five years’ time. I’ve been very blessed to keep working and I’m happy to throw myself in and trust that it’s all gonna work out. Why should people come and see Everyman? Because you’re not gonna see a cast like this again. I don’t think there’s anything like it that’s out there. Also it’s the birthing of Rufus Norris. It’s his stamp being artistic director of the National. It’s an iconic moment for him as well as everybody else. He’s the people’s director and this play is all about people. It has to reflect everybody, not just the elitist class that you associate with theatre. As a director he gets to the heart of people and why they do the things they do. I think with this play, everyone is gonna be able to relate on some level. You’re gonna be watching part of history, so come and be part of that history. This is your theatre.